Researchers at Clemson University (CU) are collaborating with a robotics institute affiliated with Carnegie Mellon University (CMU) to develop next-generation robots for advanced manufacturing across the automotive, aerospace, electronics and textile industries. 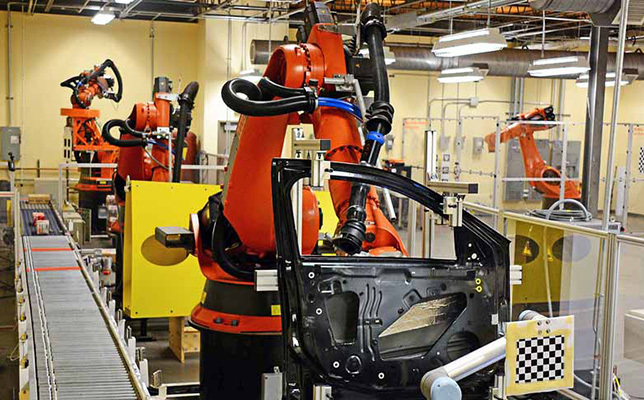 CU will also help train the workers who will operate the robots, as part of a $253 million plan to fill roughly 510,000 jobs in manufacturing by 2025. The plan comes from the United States Department of Defense (DOD), which funded the Advanced Robotics Manufacturing (ARM) Institute to develop, demonstrate and facilitate early adoption of novel robotic solutions. The institute has received $80 million from the DOD and the remaining $173 million from partner organizations. Based near Carnegie Mellon in Pittsburgh, PA, the ARM Institute brings together 231 stakeholders — 123 industrial partners, 35 universities, 10 community colleges and academic partners and 62 government and nonprofit partners — to develop cutting-edge robotics technology. The DOD has awarded $250 million to CMU to launch the institute. It will be led by a newly established independent nonprofit organization, American Robotics, founded by CMU. The main objective of ARM’s 10-year plan is to increase worker productivity by 30 percent and fill future manufacturing jobs, according to a news release. It also aims to make robots more accessible to small- to medium-sized business. The plan calls for a wide range of research on aerospace, automotive, electronics and textiles. One research project with BMW, Bosch and Yaskawa, for example, involves building a robot that can put 20-pound alternators on cars moving along an assembly line. The goal is to develop a robot that can be used in BMW’s assembly lines. In addition, CU will introduce about 20 certification programs for 10,000 operators over the next five years. These educational programs will involve virtual and augmented reality, 3D printing, artificial intelligence and other emerging technologies, according to CU and CMU news releases. “Contrary to a popular misperception, robotic automation in manufacturing is creating jobs rather than increasing unemployment. Companies in South Carolina and nationwide tell us the jobs are available but that we need educational programs to prepare operators with the critical STEM skills they need to qualify,” said Rebecca Hartley, director of operations at CU’s Center for Workforce Development, in a news release. Hartley will oversee the creation of CU’s certificate programs. "The institute will tap into CMU's research strengths in collaborative robotics, sensor technologies, materials science and human-computer interaction, areas that are rapidly transforming many sectors of our economy," said CMU Provost Farnam Jahanian, in a news release. "With this unique partnership between academia, government and industry, CMU is poised to bridge the gap between research, innovation and practice in the emerging field of advanced manufacturing." To learn more, visit the ARM Institute site.